Medical Aesthetics at Guilford is a cosmetic clinic that specializes in non-surgical weight loss, anti-aging treatments, and other cosmetic procedures. They wanted a new website and logo that was more visually striking and better expressed their brand. They also wanted to start a billboard campaign and design new marketing materials to match and promote their new branding. Because Medical Aesthetics’ primary focus is delivering beauty and wellness to their clients, we wanted to give them a logo that emphasized these qualities. The end result was a hand sketched female figure lying peacefully over the logo and the brand name in a light cursive font. This, we felt, captured the primary characteristics of Medical Aesthetics, expressing restfulness, rejuvenation, and satisfaction. We chose magenta, pink, light blue, and dark gray as the primary and secondary colors for the new brand. We picked these colors because of their floral and relaxing hues, which meshed well with the new Medical Aesthetics’ brand. 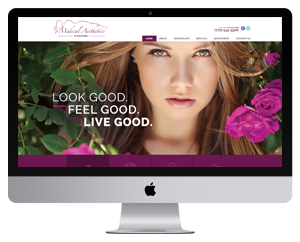 Medical Aesthetics’ priority for their new website was highlighting the amazing results they’re able to achieve for their clients. To accomplish this, we placed a sliding banner below the client testimonials on the home page to display before and after pictures of their clients. We also included a short video featuring their services and the clinic environment. Visitors can view more results on the Our Results page and learn more about Medical Aesthetics’ services on the various service pages found in the main navigation bar. 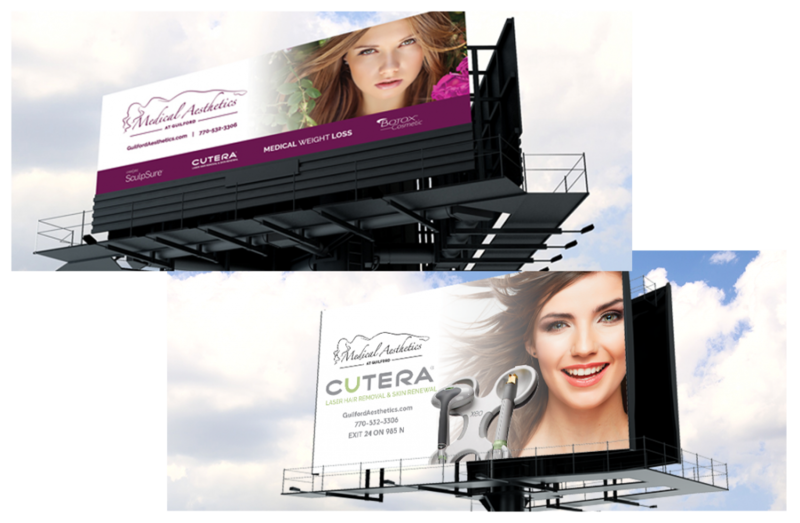 The billboard campaign consisted of two designs; one advertising Medical Aesthetics’ new logo and primary services, and another focusing on their Cutera laser procedures. 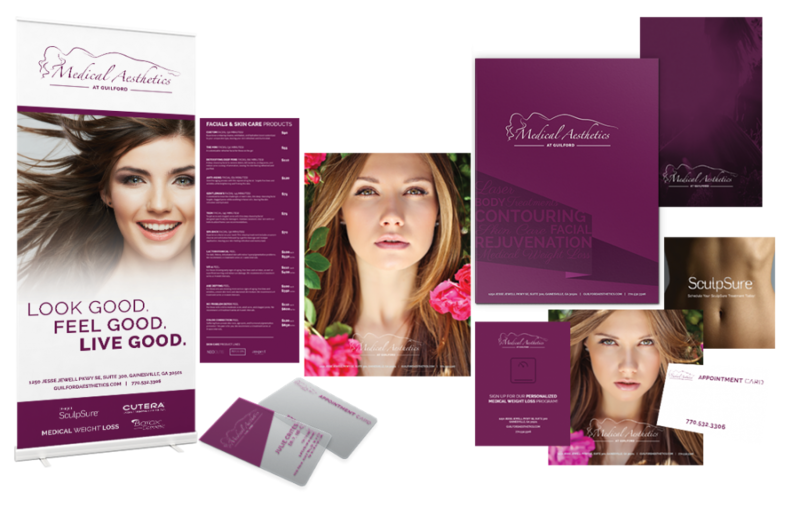 Medical Aesthetics’ print package consisted of new business cards, appointment cards, fliers, a retractable banner, and a pocket folder.